A luxury polycotton canvas Bell Tent perfect for glamping, camping in style, and those who like to take a traditional approach to the outdoors. The Solace II measures a generous 5m in diameter, which provides living for up to 6 people. 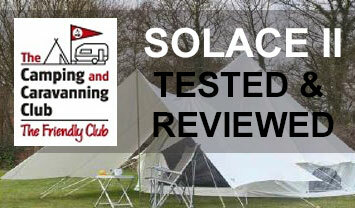 Superior to any other bell tent on the market and packed full of features and oozing quality. 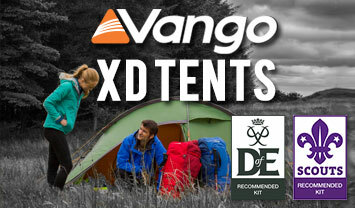 Including 2 fully removable inner tents, and a “clip in” lightweight groundsheet. Made from luscious high quality, proofed polycotton canvas, and like all our tents, comes with our Lifetime Guarantee. There are optional extras of a Canopy to extend the living space and a heavier weight “clipped in” groundsheet. Two fully enclosed (with “no see um” mesh doors) & detachable inner tents made from lightweight water repellent fabrics. Triple ventilation with 'no see um” mesh windows with internal zipped cover. Lightweight, waterproof & durable Crystal Clear window cover on outside of windows. Polyethylene clip in detachable groundsheet which can be unclipped and folded back or removed totally. Main body is 320gsm / 12oz polycotton canvas. Tough steel poles, pegs and sculptured alloy runners. Additional Universal Canopy to create more living space.